Stone Church 1, originally uploaded by Mic2006. In 1965 E.D. Ongley produced his much sought after caving manuscript, ‘A Study of Caves in Southern Ontario’. In that work Ongley mentions the existence of Stone House Cave, a tunnel that had been blasted by the railways to drain a swamp that was seasonally flooding the nearby railway. In that blasted tunnel Ongley had found an albino crayfish and he speculated that the side of the tunnel, which had been blocked by a human-constructed rock wall, likely led onto a deeper, natural cave. In the attached video, see – Looking for Stone Church Cave here, I show the caving possibilities at the edge of the Canadian Shield and I explore the small tunnel pictured above. This is not the fabled Stone Church Cave, but it is context for the next post that I will publish, which is the now revealed – Stone Church Cave. P0000199, originally uploaded by Mic2006. Echoing my own sentiments our guide says, “We hope it no make an eruption today si!” He has the habit of stuffing the microphone under his arm pit and snickering like a mad man. 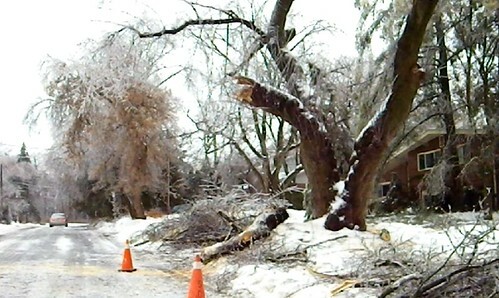 “We go 10 kilometres to 8000 feet now. In the accompanying picture you will notice, the lake down in the caldera. It is hot and acidic I am told (.01 Ph). “You put your head in the water and SSSSTT. Smells like a barracks, how you say… a foort” He hides the microphone and giggles again. Maggie, my wife, and I are in Costa Rica for a holiday. It is an amazing place but we cannot aford to go there all that often. I am hoping to have the cash again soon. Sadly the tax man was not so kind this year. We are in a little tourisimo bus winding our way from lush green slopes, planted with coffee bushes, up into the cloud forest. We pass a mountain biker, they are everywhere. Up ahead a bank of clouds hangs low; Invariably those who reach the summit find themselves in thick mist. “We are lucky today si! If jesus is with us it is sunny”. Apparently jesus is only with 30% of the tours. “Iss very important we have rules in the national park, we do not take rock or drugs, only pictures”. The “Tourismo bus” parks with several others and we file out into the thin mountain air. I hope for Jesus to appear but he is nowhere in sight. There is a short hike to the rim from here. 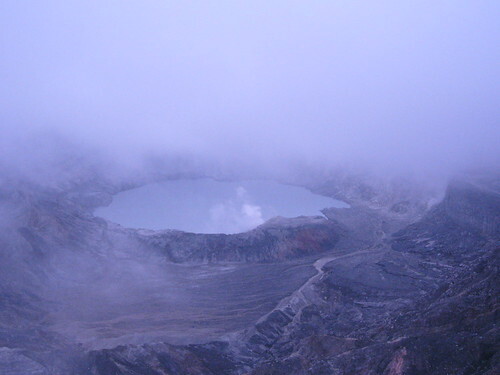 “We spend 15 minutes at the crater, if it makes eruption you run for the bus!” Jason our guide can hardly finish his next sentence; “If you do not see me and the driver, and the fire is behind you (he is doubled over now making choking sounds) we are back in San Jose already”. Its great to see a guy who loves his job, hes having almost as much fun as us. “Good luck compadres”. We are definitly noticing the elevation, I am right out of breath though it appears that there is a small patch of sunlight up ahead. Just as we arrive, Maggie dragging along in tow obsessed by the humming birds, the clouds streak over the rim. They move at phenomenal speed and we find ourselves breathing fog as thick as cotton balls. Somewhere in the mist ahead I hear the sad lament of “Jesus has left us”. We hover there on the edge and then as though by miracle, the clouds are suddenly torn away and for about two minutes we are treated to intermittant glimpses of the moonscape below. “Jesus, he has come back! You are all lucky persons. You know why? It is because you come with me”. Eramosa Karst Cave Dig (FOTEK and TCG), originally uploaded by Mic2006. Conservationists from the ‘Friends of the Eramosa Karst’ and cavers from the ‘Toronto cave Group’ have joined together over these last three weekends (Nov – Dec 2012) to hopefully expose the tunnels that all suspect lie beneath the clogged entrance of Kinney Cave. Three weeks ago this karst feature was no more than a pile of glacially rounded boulders stacked at the edge of a walking path, now there is exposed entryway into the underground. Vern, a local resident had first bought this spot to the attention of Brad, president of Friends of the Eramosa Karst. Vern could recall playing in this spot as a child, the hole was supposedly infested with Copper Heads and rattlers. Some time between then and now the cave had been filled in with enormous field-stone boulders. That is the norm in Ontario – farmers fill openings to the underground with rocks. Anyway this dig has been an epic event, a collaboration between the Toronto Cave Group and the Hamilton based ‘Friends of the Eramosa Karst’. Both have come together in appreciation of what nature has given the area and to preserve for future generations what some obviously fail to see today. For the most part the conservationists are not cavers, but they can understand the idea of preserving something for its own sake. I could hear them talking about the highlights of the area, a stream flooded to the edges of its banks, trees swaying in the mist, dewdrops on bare branches, and various small creatures that they have proudly kept a habitat for – priceless. This tunnel dig, as was pointed out, is returning the environment to what it was before farming and developers – and for me, I have this curiosity to know whats under there. Today we dug downward and along a tunnel just beneath the surface. I struggled enormously with some of the huge flaked off pieces of rock, and moving them to the surface was exhausting. Jeff Collens spent his time deepening the entry shaft and in retrospect my time would have been better spent helping him. We all suspect a tunnel down at the bottom of the pit. There is said to be at least 30 feet of elevation between this sink point and its resurgence a few hundred meters away. Marcus explained how the water that sinks here and the water that sinks at another nearby stream cross paths, obviously at different levels – resurging in places that seem to make no sense. 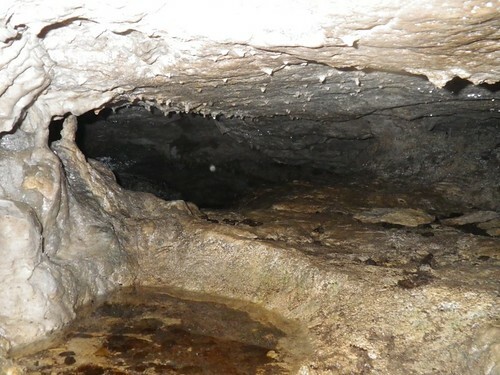 In comparing this entrance (Kinney Cave) to one that I had helped excavate at the initial clearing of the Eramosa Karst, they are very similar. Over a decade ago we began our investigation of the area at a place we called the Olmstead Caves. In a shaft much like this that we called ‘The Birth Canal’ I dug all day and the bottom finally dropped away with a distinct inward sucking of air and there beneath was a crawlway that led on to a chamber beyond. I made it as far as the chamber, but Nina Mueller and Marcus Buck (and maybe others of a slimmer build than myself) actually pushed the tunnel system way further, wiggling beneath rock flakes that are precariously wedged in muddy tubes way beneath the ground. There is so much in this area, sinkholes everywhere that are rapidly being buried and secreted away by development interests. Jeff and I are still to explore the further reaches of our epic Wasteland Waterway discovery – it is in a similar geological setting and we often worry that in not making its whereabouts known to preservationists we might be jeopardizing its existence. 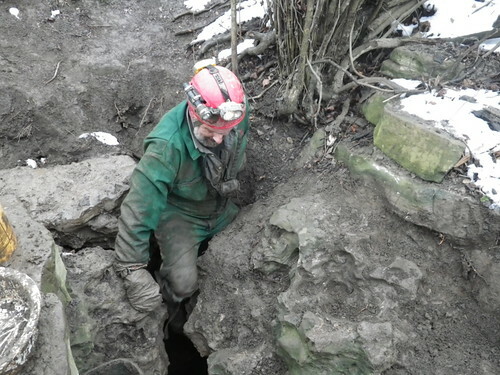 Its a tricky situation and we are hope to resolve it eventually with the good advice of those who care about this kind of thing – the caving and preservation communities. 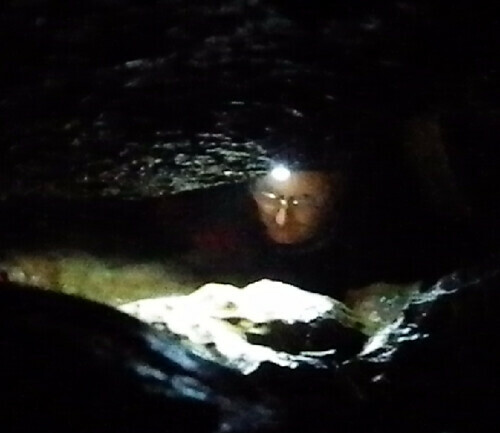 For more information on caving in Ontario, buy my book, “Caving in Ontario; Exploring buried Karst”. There is a link on the side of this page that connects to “Lulu” where the book can be purchased. Greig’s Cave yields an unexpected surprise, originally uploaded by Mic2006. As I am still recovering from my mexico trip – (a nasty ailment that leaves me wishing that I’d been a little more cautious in the cenotes), we thought that we’d take it easy this weekend and though we pass Greig’s cave several times a month, we finally stopped in for a visit. Cost is $10 per adult and there is a nice picnic area, washroom, free walking sticks and the use of a flashlight, having my caving helmet I did not inquire about the cost (of the flashlight rental). When I was younger I recall seeing that great and tacky classic ‘Quest for Fire’ and so it was with some amount of recollection that I viewed one of the larger caverns and I believe it was there that one of the epic battles between the Neanderthals and the other hairy guys took place. Another vivid memory was that unforgettable scene when the three stone-age morons were sleeping up in the tree and one of them had eaten all the leaves. I believe he was taunting a lion or a tiger beneath when the branch he was sitting on broke. 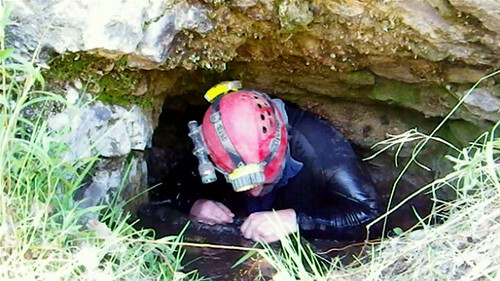 Anyway, more significantly, after a very interesting trip to Shallow Lake and the observation of one of it’s sinkholes, JC and I donned our packs and helmets and spent a little time looking for evidence of something other than the usual sea cave formative processes at Greig’s. I can’t really be totally sure of what I was seeing, I sometimes like to mull over what I have seen before I come up with a theory. For the most part there is a lot of collapse and evidence of wave action, but there was this one spot where a massive joint cut into the rock and from there a low crawling tunnel branched off along an anastomosing route – quite different from the smooth worn walls in other areas. It may have just been a rotting corroded section of rock, but the tunnels were somewhat regular and unchanging in size and one passage that I should have crawled down further, but was filled with porcupine feces, seemed to be quite promising – not so much for what you could see, but rather the floor was dirt and I wondered if there was anything that could be unearthed with a little digging (like a passage that had been miraculously overlooked). Several people have suggested the possibility of solution tunnels playing a part in the formation of Greig’s Caves – I’d like to prove that theory. The above picture is of a little squeeze beside a pool. Up ahead JC’s camera on a telescopic extension revealed a small cavern that slopes down to the left with the possibility of further going tunnel, but that is just a guess by looking at his pictures. We both tried fitting through here, but neither of us had either the ability or inclination, but Jeff is strongly considering giving it another try – I believe he will fit. It seems that there are sseveral passages oriented along the bearing of a joint that runs somewhat parallel to the clif face – one is quite long and the crawl was increasingly painful in jeans and tanktop. I hope to prepare a little video sometime later in the week. All in all, the $10 was well spent. The property is very scenic and we suddenly realized that we’d spent several hours in speculation. Admittedly this is not a wild cave, but it certainly has some interest and who could possibly shun it for the fact that it was the setting of that great theatrical masterpiece of my teenage years – Quest for Fire. If you are looking for a casual outing with your kids, providing you keep a good eye on them as there is plenty of opportunity for injury, this could well be one of the fun things to do near Toronto. This is a good example of what cavers call spelunking. I felt a little overdressed with my helmet, but what the heck.